With more time to think about the route come more ideas and a few more points to think about. There’s the matter of smaller team sizes, whether doing Alpe d’Huez twice is hard, a sneak peek for Paris-Nice and more. The first week is going to crucial, action-packed and dangerous. We will still get several sprint finishes but Stage 2 has a lot of climbing. The team time trial will reshape things and then we have two mountain stages at the end of the first week. By contrast the second week is more sleepy. Monday starts with a rest day then a nice stage across Brittany will see big crowds ahead of the anticipated time trial on Wednesday and then Thursday and Friday look relatively dull. This sets the race up for the final week in the Alps where the overall should be determined. It’s possible the winner emerges in the Pyrenees and then defends their lead in the Mont St Michel time trial but they will be tested in the final week. Regularity and recovery matter plenty in the final week. There’s been talk of smaller teams in the race, shrinking from nine riders to eight. With no change in the number of teams invited the idea is two fold, first to improve rider safety as fewer riders crowd the road. Second it makes the race harder to control for a single team. This is something being explored by the UCI and ASO but it is at an early stage, an idea to study. Teams won’t like it, it removes their ability to control the race, especially the big budget teams. But as many would point out, Team Sky lost Kanstantsin Siutsou in an early crash and managed to keep the race locked down for the following two weeks. A marginal loss you might say. The French media have been calling the double climb of Alpe d’Huez a pousse au crime meaning it will push riders into the crime of doping. The 20 second clip from Radio Totem gives an example, the idea being it’s hard enough tackling this climb once so surely twice is inhuman? Only I have to repeat what I wrote during the week: it’s not as hard as it sounds as the race often approaches the Alpe via the Glandon or Galibier. After the early climb of the Col de Manse there’s flatter section and things only get going for the final 70km. There’s nothing wrong with the stage. Overall the race offers fewer kilometres. The subject of whether a race is so hard is probably worthy of a proper analysis but note that people cheat for the 100m in athletics and there’s not one a single mountain pass on the route. As the BALCO trial revealed even sprinters were taking EPO. Prudhomme has left his mark on the race but he’s learning too. A former journalist and TV presenter, he knows that the race must be made for television. But he’s got a romantic side – as covered last July – where he sees each incline as a potential launchpad to glory, every hairpin bend brings a twist to the race and the French landscape is full of symbolism rather than tarmac. The last time we had Mont Ventoux the script promised a showdown where riders fought for the overall. But in 2009 we saw the riders mark each other up the Ventoux. The same in 2010 when the Tourmalet was supposed to judge the race only Andy Schleck and Alberto Contador matched each other and held hands at the top before the Court of Arbitration in Sport finally settled the result. 2013 looks a touch more realistic and the short time trials offer a mix that makes the race more open, as if Prudhomme knows you can’t pin too many hopes on a single stage. Talking of pins, you might remember the multiple punctures on the Mur de Péguère climb of the last Tour de France. A police investigation has been opened. Where are things now? “There’s no news” is the answer and this looks like it’ll be an unsolved crime. A few people have been asking when the full route comes out. The answer is normally in May. But you can plot it yourself for some of the mountain stages or if, say, you’re planning a trip to France and want more precision, email me and I’ll try to help. If you’re tempted to visit then I’d recommend the Alps as the time trial is good to watch and Alpe d’Huez will be wild. On the subject of route details for next year ASO sell the right to host a Tour stage as a package, whereby towns who bid for the Tour are encouraged to take on other races like Paris-Nice. And when a town bids, in fact each tier of regional government in France often contributes. So when Mont Ventoux won the bid to host a Tour stage, the nearby Montagne de Lure ski station gets a stage of Paris-Nice in 2013. It’s a smaller version of Mont Ventoux and also featured in 2009 too when Contador won. It seems when the Tour gets Ventoux, Paris-Nice gets the Montagne de Lure. It’s a hard climb especially for the early season race and means the 2013 edition of Paris-Nice looks set to suit the climbers. The route for this race should be announced in late January. 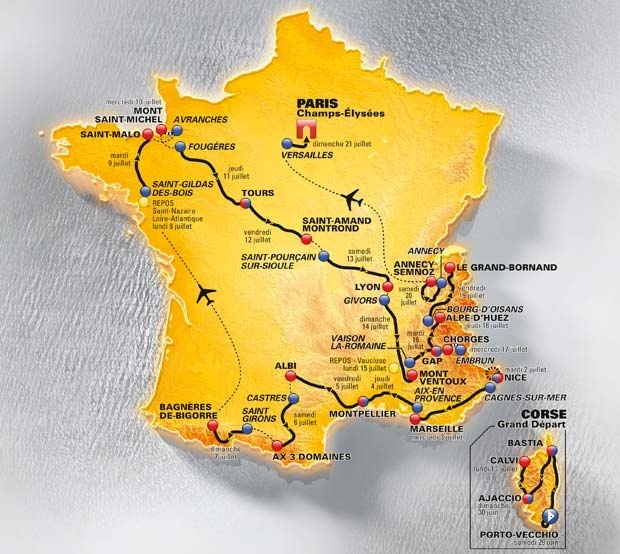 I’m liking the look of the route so far from what I have seen, will be nice to have Andy Schleck and Contador back to add to the battle – I’m still wondering how Andy will play this one, depending on what happens to his brother, which reminds me, when are we supposed to hear about Frank? It’s gone about as quiet as the ‘Tac’s in the Road’ investigation? It is a pleasure to get back to racing in the current time. Thank you for an article with good insight! This is why I tune into InnerRing!! Think you’ve called it correctly suggesting week 2 will be “sleepy” – not necessarily boring, there will be lots of sub-plots, but I expect contenders for the GC to be keeping their powder dry for the third week. The Vuelta (and the 2011 tour Stage 16) proved that given the close marking on the big alpine stages, a sneak attack on a stage that is easier on paper is definitely on the cards. Look out if it is cold and wet, in particular. I think it was always going to be hard to get a result on the punctures, either the TV evidence showed obvious things or witnesses came forward fast or the case goes cold. My worry is that if these people are not caught then they could come back or others will copy them knowing they might not be caught as well. That is an excellent point about reducing team size below 8. If, as inring points out, the Tour is designed with television in mind, it is dificult to understand how 9 man teams enhance the television spectacle, unless a “controlled” race equates to a closer race over 3 weeks. Perhaps it would be possible to experiment with smaller teams in stage races other than the Tour. Most stage races do have smaller teams. Who knows is this is why them sometimes throw up better racing. You get as many dull 1 week tours as you do exciting ones, the route and the riders play a much more important role IMO. This years tour wasn’t dull as SKY had so many riders, afterall they had 8 for most of the tour and Cav and Eisel had different aims. It was dull because nobody attacked them in the mountains or in the transition stages. It’s not so much about how Sky blocked the race last year (if a team has 4-5 of the best ten climbers, then that’s it), it’s about bringing about a change in culture concerning the stages that don’t finish uphill, by reducing the likeliness that teams interested in bunch finishes will reach their goal, thus making it much more profitable for GC-interested riders to try and make a mess out of a flat or hilly stage. Thanks for pointing out the Alpe stage is far from the horrible brute some are making it out to be. Don’t they approach it via the Ornon (11 kms @ 5.8% avg grade) on a relatively short stage? Sure, they go up the Alpe twice but it’s “only” 13 kms @ 8.1% with a max grade of 10.6%…far from say, the Mortirolo at 12 kms @ 10.5% and a max of 18%. Nonetheless, it’ll be a wonderful stage for the spectators who make the trek out there, seeing the whole peloton pass by twice! The Alpe is definitely not that hard. Every hairpin finishes in 20 flat metres, and gives a chance to breathe. Looking forward to this race already!! Two HUGE transfers via plane. Good luck to the mechanics to get the trucks there on time. Now THERE is some incentive to dope! Oh, they do dope. Remember Landis? But I suppose those are allowed (unless some riders are preparing to use mechanics urine for doping control, haha) since they are not exactly performance enhancing. I agree with the two posters above concerning the reduction of team sizes plus a couple of additional wildcard teams. I have long believed that the current, rather stale format has given us an increasingly predictable outcome on almost every stage. Long range breaks and attacks are now almost a certain failure due to team sizes and radios. Even worse, escaping riders are often regarded as nothing more than hapless no hopers. It is important for the future of the sport that some excitement and rider courage again become elements of the race. How many times have we heard the old 10km/1min from commentators. Throw in a few unpaved climbs and I would be really happy ! The Sarenne over the back of ADH will play a nice cameo role. It’s pretty wild and untamed at the moment (better for cross country running), although I think they’re obviously going to upgrade it a bit. If there’s wind coming down the valley it can be pretty hairy. The difficulty on ADH is all relative – for some it feels steep, for others it’s a big wide runway to cruise up. What always hurts is the relentless heat if the sun is shining. There is very little cover and the tarmac sits in the sun all day soaking up the heat. Bit like the fans soaking up Amstel on Dutch corner. I guess the Alpe d’Huez gets its reputation more from its position than the absolute numbers. As mentioned above, there’s a whole bunch of climbs that are both steeper and longer. But the Alpe has almost exclusively been used as the final climb of a mountain stage. That means it’s decisive and you have to go full out. If you have the right gearing, it’s only the pace you go at that determines how hard a mountain is, the grade only sets the relative importance of drafting and weight. I agree the Sarenne will cause a nice battle. The first big attacks will be launched at the top of the first Alpe climb. After a short downhill section, the attackers will be faced with a short but difficult 3 km climb to the Col de Sarenne, followed by a steep vertical to the Romanche valley. So, a good all-rounder or even a climber could easily reach the foot of the second Alpe climb, alone or in a small group. And go for the victory and a good overall result. The reason the Alp climb is hard and sometimes decisive is the very difficult start at the foot of the climb. Very steep and a lot of hairpin bends. Normally it’s the inverse. The better climbers can and have to attack at the foot. After the first 2 km it’s a mano a mano fight. But this will not happen at the first Alpe ascension. I really hope that one of the GC contenders will attack during the 1st Alpe d’Huez ascent. And even if the surface is likely to be upgraded the Col de Sarenne descent is technical, a guy like Nibali could use it to create a nice gap and go full gas in the final climb. As a fan of cycling I’d like to see that happening but nowadays riders are more interested in protecting their position in the GC than in showing panache. If Nibali is there. Seems more likely he will do the Giro next year. We’re going to the alpes for the full week they’ll be there. A lot of accommodation is already booked, so you should really get going if you want something. If you’re not fussy, there’s still plenty of apartments but most of them will have no internet connection and be a bit primitive. Some of the expensive chalets and houses are still available, but they are just that. Expensive! We where at alpe d’huez in 2011 and the crowds where big, but not overwhelming. I’ve heard people talking about the TT in 2004 being crazy with someone quoting 1 mil. people. I’m wondering if the double climb next year will attract the same interest from the crowds? I think the crowds will be very big as it’s an obvious focal point for the end of the race. But one million was probably too much. It’s 13km long so imagine 500,000 on each side of the road and that means 38 people for every metre of the climb on both sides of the road. Given you can’t stand everywhere the number is too high. But the crowds were still huge. The whole Alpine experience should be good with several spectator-friendly stages like the time trial and Alpe d’Huez. The final one above Annecy should be good too but maybe better to watch on TV. Good points about making it clear that it is the nature of competition, not a gruelling parcours, that stimulates doping. Motorcycling has more doping offences (and less sanctions) than cycling. Someone should take a look at the (pre-EPO) 1983 stage to Morzine. That should be the standard of what can be considered “gruelling” (and given that bikes are quite lighter and more efficient these days, and that riders now have computers that help regulate efforts, stages should, accordingly, be quite tougher, as Zomegnan understood well when programming the now classic Gardeccia 2011 stage). The 2013 TdF can by no means be considered “mountainous”.